The 2018 edition of the ‘Meeting voor Mon’ was held on the 4th of August just before the ECh in Berlin. On the one year old new track and in warm conditions Briton Kaie Chambers-Browne took the victory in the 100m with 10.34. He was one hundred of a second faster than local Andreas Vranken. Another Briton, Jamal Rhoden-Stevens, won the 400m in 46.83 in front of Julien Watrin and his 47.01. Due to the hot temperatures the 3.000m was held later that evening and that resulted in seven runners below eight minutes. Kenyan Joshpat Menjo was the best in 7.53.09. In the field events the Jamaican Chad Wright threw the discus at 63,82m. The Belgian Timothy Herman was the best javelin thrower with 75,90m preceding the Bulgarian Mark Slavov with 74,76m. Due to the works for a new track surface and for the adaptations on the stadium for the throwing events, the 2017 edition of the ‘Meeting voor Mon’ was only held on the 19th of August after the WCh in London. Despite that, there were some excellent performances as the 7.55.41 of Kenyan Menjo Josphat Kiprono on the 3.000m or the 15.32.92 of his compatriot Pamela Cheprotich on 5.000m. Tony van Diepen of the Netherlands ran a PB of 46.43 in the 400m and Margareth Adeoye (GBR) stormed to 52.56. The Canadian Anthony Romaniw won the 800m in 1.47.34. The 400m hurdles saw a strong Noelle Montcalm, also Canadian, win in 56.47. In the men’s race Lucirio Garrido from Venezuela beat the local Tim Rummens with 3 hundreds: 50.50 against 50.53. In the pole vault, European u23-champion Ben Broeders from the organizing DCLA won with a clearance of 5,42m. The shot put went to the Dutchies with 17,58m for Melissa Boekelmans and 18,65m for Patrick Cronie. The 2016 edition of the ‘Meeting voor Mon’ saw an extraordinary 800m race, which let no less than 8 women run under 2.03. The Dutch athlete Sanne Verstegen won in 2.00.83. Another Dutchie, Femke Pluym, equalized the stadium record in the pole vault, jumping 4,40m. Two other stadium records were beaten in the women competitions. Paula Ratcliffe from New-Zealand had a great hammer throw of 70,12m and Manon Depuydt bettered her own time in the 300m to 37.95. The young Renée Eykens took another highlight by winning the 1.500m in 4.10.12. The only new stadium record in the men section came after a battle between two Dutchmen in the pole vault. Menno Vloon won it with 5,58m and Rutger Koppelaar finished second with 5,53m. The local fans saw an astonishing victory of Stijn Baeten in the ETOL-800m. 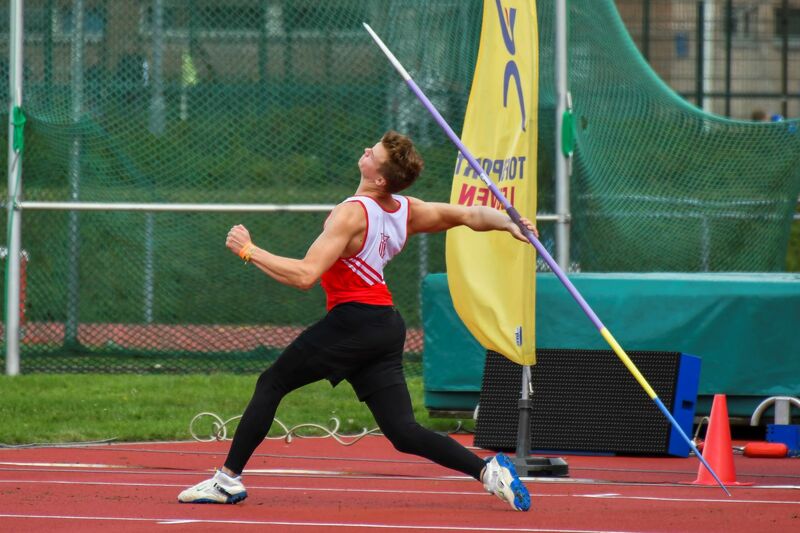 The 2015 edition of the 'Meeting voor Mon' was an astonishing one, not only because of the strong Belgian record of Philip Milanov with 66m66 in the discus throw. But there were also a lot of other great performances as well as the first race with the three brothers Borlée in adjacent lanes. Due to the wind at the opposite side of the track the athletes couldn’t unfortunately find the right rhythm, but the finish was an stunning one. Kévin won the race in 45.79 in front of the Irishman Gregan, the Frenchman Anne and his brothers Jonathan and Dylan. Not less than seven stadium records were broken during this meeting. Philip Milanov got the most attention by improving his own record of 66m43 from the 26th april with 23cm. In the pole vault, the record of 4m15 was even beated three times and was brought eventually to 4m40 thanks to Rianna Galiart from the Netherlands. In that event Chloé Henry tried to clear 4m45, which should have been an new Belgian record. Michelle Jenneke ran 13.10 in the 100m hurdles; afterwards the Australian became 'the queen of the selfies', because nearly everyone wanted a picture with her. There was no stadium record in the 5.000m – Fernando Mamede got it a long time ago in 13.20.0 – but the Qatari Tarik Ahmed Alamri ran a strong 13.25.00. In the 110 hurdles only the thousands of a second could split the first two. The Canadian Sekou Kaba won from the Australian Nicolas Hough. They both got a time of 13.64. In the field events another Canadian, the young Timothy Hendry-Gallagher, was impressive with 19m35 in the shot put and de French girl Alexia Sedykh got her hammer at 66m42. Despite the following European Championships in Zürich a lot of athletes made their appearance in Kessel-Lo for this 20th edition and they bettered 6 stadium records. The head wind couldn’t stop the spinters in the 100m as the broke both records. The Jamaican Carrie Russel realised 11.47 and Adam Harris from Guyana 10.30. The German Pamela Dutkiewicz followed the example in the 100m hurdles with 13.30 and het British junior David Omorogie dashed an excellent 13.74 in the 110m hurdles. The stadium record of the 300m also fell thanks to the 39.31 of Manon Depuydt. Later on the evening the Irish Sara Treacy had an exuberant win in the 3.000m steeple with 9.47.92. With that performance she kicked Veerle Dejaeghere out of the record list of the Arena. In the field events the German Benedikt Stienen threw the discus 58,16m and that was the sixth record of the successful meeting. Local athlete Hanne Claes realized the best women performance of the 2013 edition by dazzling the 200m in 23.26 (+1,3m/s), beating the stadium record of Margaret Adeoye with 4 hundreds of a second and equaling her PB. Another stadium record fell thanks to Sven Mohsner in the hammer throwing. The German reached 71,01m and that was exactly one centimeter better than his compatriot and ‘habitué’ of the Meeting voor Mon, Benjamin Boruschewski. The edition 2012 of the ‘Meeting voor Mon’ took place on the hottest day of the year, which meant temperatures of more than 40° on the track. Therefore the long distance races were moved till later on the evening. It didn’t bother the American Kim Conley to set a world leading mark of 4.27.23 on the mile, beating Almensch Belete, who broke the Belgian record with her 4.28.11. Other excellent performances came from the Canadian Melissa Bishop on 800m with 2.01.54, from the Ethiopian junior Aga Ruti with 15.20.84 on 5.000m and from the Ethiopian Dame Tasama with 7.50.60 on 3.000m. Dat betekende in het totaal negen stadionrecords en daarvan waren er zelfs drie records van de Flanders Cup: die van Jonathan Borlée , Almensch Belete en Nora Aida. Daarnaast mocht het duel tussen Amy Mbacke Thiam en Muriel Hurtis zeker gezien worden op de 400m en bevestigde LaTavia Thomas haar zeges in Gentbrugge en Ninove met winst op de 800m in de AtletiekArena: drie op drie! Op die afstand won de Ier Mark English (what's in a name?) bij de mannen met een nationaal juniorenrecord van 1.47.09. Maar traditioneel lieten de Vlaamse atleten zich opmerken, zoals blijkt uit de gelukte bonussen, waaronder een resem voor atleten van minder dan 23 jaar. Bij DCLA blonk Tim Rummens met een indrukwekkende winst in de tweede reeks van de 400m horden in een PR van 50.60 (de vierde tijd in het totaal), net als Charlotte Debroux, die vijfde werd van de 800m in een PR van 2.03.67. Allebei verbeterden overjaarse en nog handgestopte clubrecords. Brenda Baar breaks Dutch National record in triple jump. Garcia Rosibel pushed the Belgian Athletes to new personal records, but still manages to win the 800m in 2.03.80. Kia Davis ran a stunning 400m race succeding in 53.50. The 800m and 1500m male races turned out to be tactical resulting in close finished won by Baloyi Onalenna (1.48.29) and Stephen Davis (3.44.48). Zoe Derham threw a new Flanders Cup record (Hammer - 66.27m). New stadiumrecords: Mimi Belete (1500m 4.17.93), Christian Hoffman (Ger) (110m hurdles 14.09), Tom Goyvaerts (javelin 72m31). Roto Natashon (Ken) wins a tight and tactic battle on the 800m in 1.47.31. Luis Fernando Moro (Esp) and Denis Goossens (Bel) reach 5m15 in pole vault. Belgians best throwing athletes, Wim Blondeel (shot put 18m15), Catherine Timmermans (shot put, 15m17) Ilse Struys (Javelin, 53m41), Tom Goyvaerts (Javelin, 72m31), get competition from German, French, Canadian, Spanish and english athletes. A breath taking 800m was won by Vice-European Champion 2006,David Fiegen (Lux). Jimmy Lomba (Fra) and Joeri Jansen (Bel) joined him on the podium, while Nils Schumann stranded on a fifth place. Flanders Cup Records were broken by Anne Battke (Ger), Rianna Galliart (Ned) on the Pole Vault. Denis Goossens (Bel) qualifies for the European Championship (Pole Vault). Anke Van Campen (Bel) and home athlete Liesbeth Van de Velde (Bel) qualify for the European Championship U23 (5000m). Veerle and Wim Blondeel (Bel) hold the new stadium records in discus throw shot put. Kim Batten (USA) wins the 400m hurdles. Inge Vangeel (Bel) en Thomas Matthys (Bel) qualify for the World Championships for juniors. Bianca Achilles (Ger) holds the new Flanders Cup record (Hammer throw), Wim Blondeel (Bel) is the new Flanders Cup Record holder on Shot put. Belgian athlete Timothy Hubert (High Jump) qualifies for the European Championships U23. Sandra Swennen is the best athlete on the triple jump and 100m. Sammy Kiplagat (Ken) wins the 3000m steeple.